The atmosphere around the little blue house has been extremely unsettled since August when Hurricane Irene and that other unnamed storm swept in and knocked us off kilter. That was just the beginning. In rapid succession, one blow after another was rendered — first the critters got seriously sick and just as they were recovering, it became clear that brother Pete needed real medical attention. Now, the dust is settling, so to speak. As Thanksgiving approaches, Pete is in the hands of a fine medical team and we’re looking forward not only to our niece, Sophia’s wedding on Nov. 19 but to celebrating Thanksgiving with our family and friends in the days to come. It’s time to breathe deeply, pray greatly and get back to blogging about food and faith. Nothing gives me more comfort and few things give me greater joy. Today, I managed to take a breather at the Trenton Farmer’s Market and explore the fall produce. The shelves are chock full of Jersey apples, all manner of potatoes, brussel sprouts, fresh pulled carrots topped with lacey greens and even late Jersey field tomatoes. It couldn’t be better. I bought two bunches of carrots so the rabbits can nibble the fresh greens. The carrots themselves will go into a beef stew I’m cooking up for Pete (more about that on Monday). But this is New Jersey afterall, home of the cranberry bog and it warmed the cockles of my heart to see boxes full of cranberries lining the shelves. With an eye toward family visits over the next couple of weeks, I bought three pounds and plan to turn it into relish. 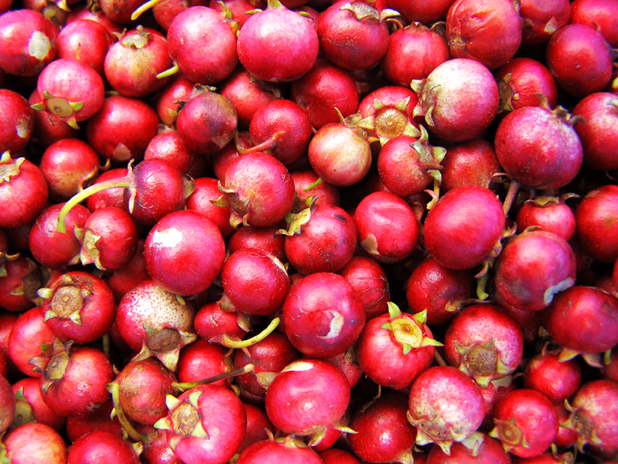 This year, the focus will be on creating a really good cranberry mustard relish, the likes of which Pete and I discovered at a local farm market this summer. Because cranberry concoctions have been a Thanksgiving tradition for as long as I can remember, and because we love Dijon mustard, I’ve been working on creating a Rogers version for our table. This is the first variation, adapted from several Internet sites, on what will likely become a theme. Ingredients — 1 pound fresh cranberries, 1 1/3 cups sugar, 4 tablespoons good Dijon mustard, 2 tablespoons whole grain Dijon mustard. Preparation — Combine cranberries and sugar in a heavy saucepan. Stir over medium heat until the sugar dissolves. Continue cooking until cranberries begin to pop, stirring occasionally. Cool completely. Stir in both mustards. Cover and chill. This can be made one week ahead of the big meal.